I recently went through all of mine and threw them away, too. I don’t know if I, personally, am healed, but I do know I’m ready to move forward. Infertility made me a stronger woman and just because I rid myself of the physical reminders (needles, HPTs, empty vials, etc.) does not mean I’ll forget the lessons learned and friendships made. I’m glad you are at a point in your journey that you can let these tangible reminders go, too! Yes! It will never (and can never) be forgotten – and I wouldn’t want the experience to be forgotten. I just don’t feel the need to keep the physical reminders around any longer, when just a few months ago, I had all of those bags out and thought really hard about getting rid of them, but just couldn’t. I don’t know what changed, but something did. It felt so good to let it all go – because holding onto them was so important to me for some reason for so many years. I truly feel that I’ve let go of the painful part of our IF and now can view it as a truly wonderful experience that brought us to a happy ending. But no – I will never forget the pain we went through – all the trashing of physical reminders in the world won’t let me forget that. Sometime last summer, I stumbled across my bag of HPT’s from Raegan’s cycle. I thought about keeping them, but instead I took a picture and then tossed them. I have a picture of the first test at 8dp5dt and the group of HPT’s. But I didn’t see the need to hold on to the actual sticks any more. I waited until Raegan was 3 months old before donating my extra meds back to my clinic. I still have the sharps container b/c I didn’t know I could just toss it in the trash, so that will be going out next trash day, once I remember what I did with it. As for this cycle, I’ve held on to all of my HPT’s. I took pictures so when the time comes I can toss these too. But I have a little superstition about holding on to these as well as my left over meds until this baby is home safe in my arms. Next winter, while I’m trapped inside with 2 small children, I will get to throwing these things away. For me, it’s only part of the healing process. I don’t know if I’ll ever be healed from my IF journey, but I will definitely say I go into remission. But it’s always there…always a part of who I am and a part of how my child(ren) came to be. I think this is wonderful and I’m so proud of you. Leaving the pain behind is a HUGE thing and I know someday I’ll get there. At least for now I have seen some wonderful women go through this healing process, and it’s inspiring and hope giving to me. Well, you can’t just toss them in the trash – at least you can’t here. You need to take them to a drop-off location but they must be in laundry bottles or official sharps containers. We need to find a drop-off! The pain is definitely feeling more in the past than ever before. I’ll never forget, but I think I’m done crying when I think about it – and that’s huge for me! Healing is such a great thing, isn’t it? 🙂 I still have the first pee stick from Stella’s cycle and from this cycle, for sure. I’ve slowly gotten rid of meds and needles and such too. Yes it is! I’m just shocked that I was SO READY to throw it all out. I wasn’t expecting it – and it wasn’t planned – but it sure did happen easily! That is a good feeling. I am mostly healed from our journey, though i can’t say fully because I know I could never go back to trying (for a lot of reasons, but one is fear). I am so glad you are there!!!! You know, the “going back” was the hardest part for me when we tried for this second baby. It was a big leap of faith to jump back in it. We’ll likely do it again for a third, but we view a third as “our bonus baby,” meaning that we don’t expect it to work but if it does – TERRIFIC. I don’t think it will be as hard to jump in knowing that our family feels right the way it is, and a third will just make it feel better! I still have everything, HPT’s, fertility meds, syringes, sharps containers, and 2 more rounds of Follistim in my fridge. I haven’t been able to dispose of any of it yet, I haven’t quite made peace or fully healed for what IF has taken. Hopefully someday soon I’ll be at the same place you are, ready to go through and clean up! Isn’t it weird how we all tend to hang onto these things? Everyone I know, with the exception of one person in my “real life,” has hung onto the meds, sharps, etc. for some time until they’re just ready to let them go. I wonder WHY we hang onto the tangibles… it’s weird. But it’s seeming normal! 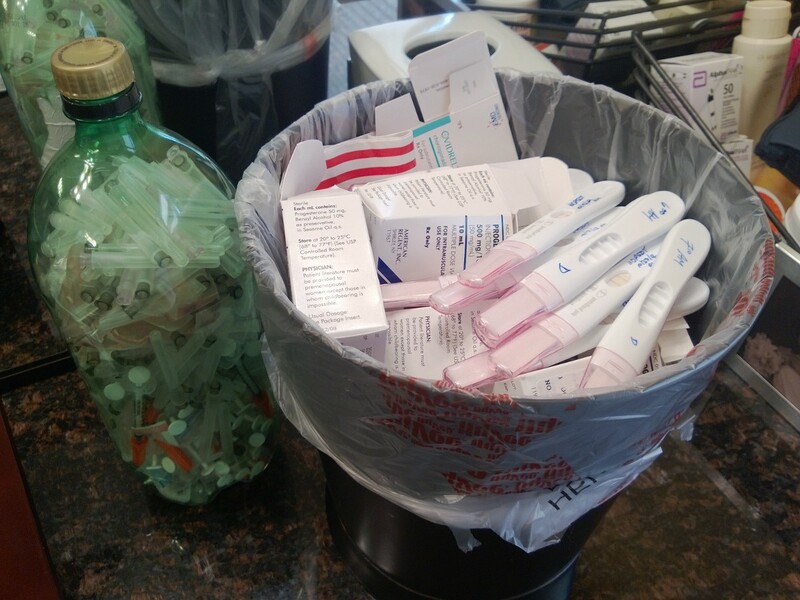 It is amazing the amounts of needles and drugs we go through. I truly thought I was done throwing out the syringes and needles, but found this bottle and was shocked! I know I threw out an entire 2 liter just a few months ago of IVF needles. How could this whole process have filled up two 2-liter bottles of needles? Unreal. so glad you are feeling healed! I never hung onto positive HPTs long, but I do still have my sharps container that I need to dispose of, and unused needles, and a complete vial of Follistim 900 IUs that no one seems to need!